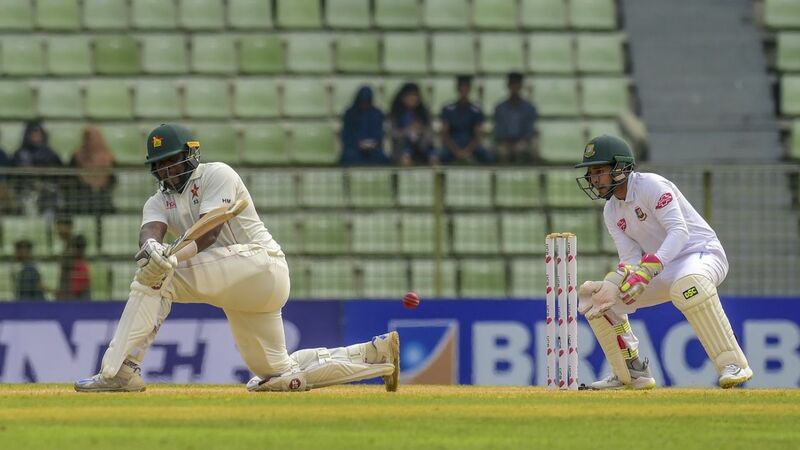 Zimbabwe extended their lead to 230 runs after they reached 91 for 2 against Bangladesh in the first session of the third day. Hamilton Masakadza and Sean Williams were unbeaten on 39 and 16 respectively, having already added 44 runs for the unbroken third-wicket stand. The pair came together at the fall of Brendan Taylor’s wicket, when he was very well caught by Imrul Kayes running back from mid-on. Taylor struck four boundaries in his 25-ball 24 that added some energy into the Zimbabwe innings after it was meandering along at less than two runs per over in the first hour. Brian Chari, dropped on 1 by Nazmul Islam at point, fell for four runs later as Mehidy Hasan bowled him with a delivery that held its line. Taylor followed it up with slog-swept fours and couple that were driven straight. Williams, who made 88 in the first innings, started the second dig by hitting Mehidy through midwicket for four, before Masakadza added three more fours until the lunch break.